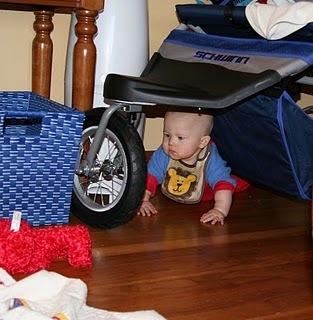 Not only is Ruslan still having fun with crawling backwards, he is getting really fast. 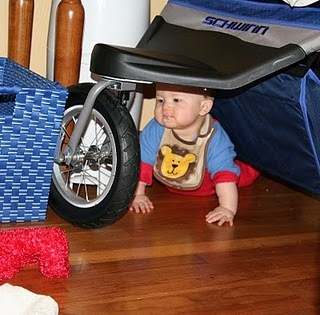 Once he gets the hang of moving forward, he is going to be getting into everything. While I am sitting there playing with them, Ruslan hangs out and plays with the toys. As soon as I leave the room he is on the move. 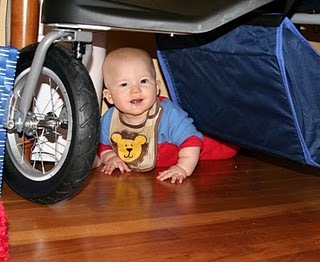 He crawled his way under the stroller and then along the back wheel until he was stuck against the wall – but he was smiling and incredibly pleased with himself at his accomplishment. I pulled him out, turned around for a minute and heard him crying. He was back under the couch, only the top of his head was sticking out this time and he was really mad that he was stuck (so no pictures that time).